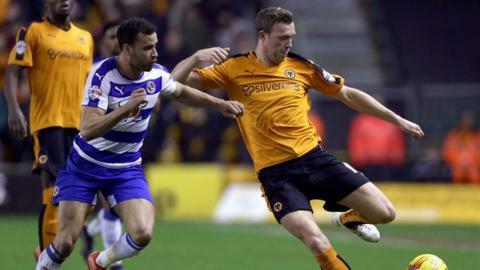 Wolves head coach Kenny Jackett is to sit down with Kevin McDonald this week to discuss whether the midfielder has a future with the club next season. The 27-year-old was player of the year in his first season at Molineux in 2013-14 when Jackett's side won the League One title. But he has fallen out of favour this term and has not played since 8 March. "He's disappointed that he hasn't been playing but he's professional and has worked hard in training," said Jackett. "We've had discussions about his overall situation. He understands there has to be some type of summing up. That will be this week. We'll talk about it and we'll see what happens." McDonald has been linked with a move to Scottish Championship winners Rangers. But Jackett insists it is the formation he has used in midfield that has led to McDonald's continued exclusion. "We need to be able to work to a two," he said. "We need to play next year and have enough where we can have a second forward, a very offensive number 10, that's where I want to get to. "How does that impact on my central midfield? I'm looking for the right pair. "It depends very much depends on how the conversations go, how we shape our squad, exactly what we have to spend and where we need to improve." Meanwhile, Wolves have released six players, as well as allowing their two loan players, striker Adam Le Fondre, and goalkeeper Emi Martinez to return to their respective clubs. Martinez goes back to parent club Arsenal, while Wolves have opted not to take up an option to buy Le Fondre following the end of his own season-long loan. Wingers Zeli Ismail and Razak Boukari, strikers Liam McAlinden and Bjorn Sigurdarson, midfielder Tommy Rowe, who has been out on loan at Doncaster, and reserve keeper Aaron McCarey have all been let go too.